The Model 1162 Safety Light combines a full-size flashlight and a flood/flashing safety light in an all LED compact light-weight package. Two body mounted push buttons control the lighting functions. The top button powers the tight-beam, long-throw 150 lumens flashlight in either momentary or constant-on mode. The bottom button controls the safety light. Pressing the bottom button once, turns on the BLUE safety lights at full-power. Pressing the button a second time powers the safety lights down to half-power. And a third and final press, causes the BLUE safety lights to strobe. 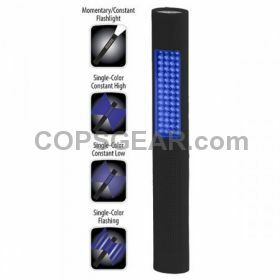 For added utility, there's a removable magnetic clip and lanyard ring included with each light. Powered by 4 AA batteries (included). The 2-In-1 Safety Lights are the perfect choice when directing traffic or marking a hazardous area.